This is where I studied for the LSAT, where I write, where I read, where I eat and where I’m usually found at home. All my mail winds up here before it nests in different places around my apartment. My mail nests in different nooks of my apartment. The glittery good-luck card on my refrigerator that reminds me I’m “Da Bomb.” The letters from my friend Kevin tucked by my bed, their Taiwanese stamps framed by striped envelopes. The Iowa Hawkeyes stationery my mom turned into a cute Future Tay checklist after I took the LSAT, peeking out from my makeshift study corner. The “This Card is 100% Gluten Free” mail a friend sent me during my weekly IVs. 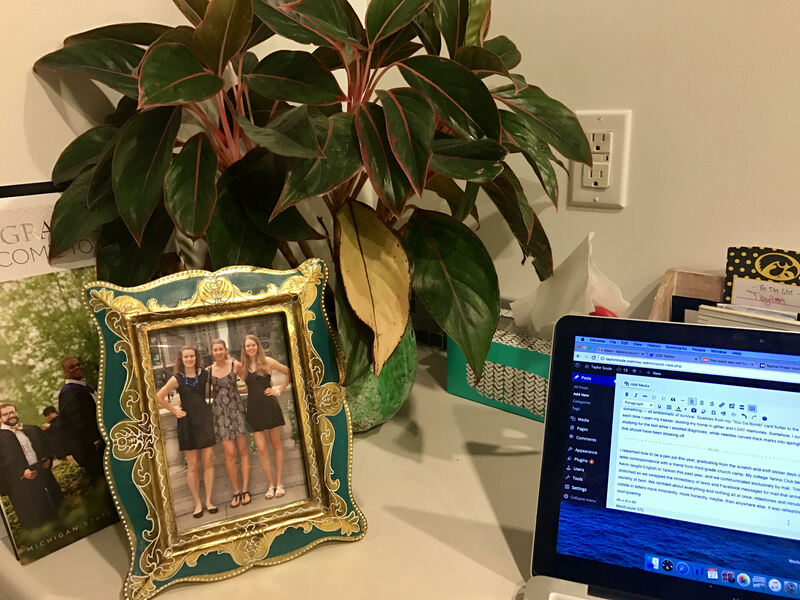 The law school admission packets perched behind the framed photo of me and my sisters; sometimes I open the folders to confirm they’re real, that it’s OK to want things, that I’m good enough for those things. 2016 lives in the letters and cards scattered throughout my apartment, each emblematic of something — all emblematic of survival. Sparkles from my “You Da Bomb” card flutter to the floor each time I open my freezer, dusting my home in glitter and LSAT memories. Somehow, I survived studying for the test while I awaited diagnoses, while needles carved track marks into springtime skin that should have been showing off. I relearned how to be a pen pal this year, graduating from the scratch-and-sniff sticker days of my letter correspondence with a friend from third-grade church camp. My college Tennis Club bestie Kevin taught English in Taiwan this past year, and we communicated exclusively by mail. Time stretched as we swapped the immediacy of texts and Facebook messages for mail that arrived monthly at best. We rambled about everything and nothing all at once; milestones and minutiae collide in letters more innocently, more honestly, maybe, than anywhere else. It was refreshing and soul-quieting. 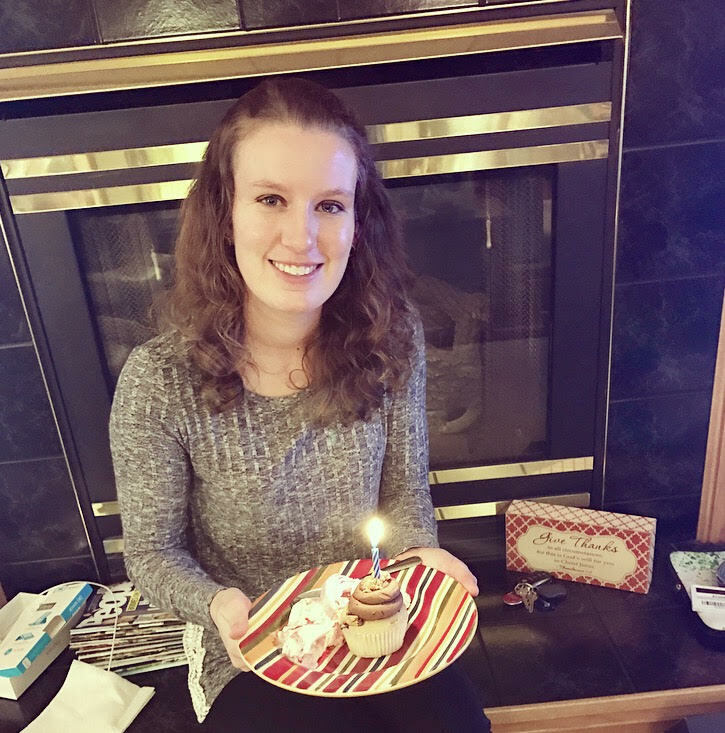 This entry was posted in On Reflection and tagged celiac disease, gluten free, law school, LSAT on December 27, 2016 by Taylor Soule. I haven’t been eating enough. I know it. Snacks nest at the bottom of my hulking work bag, they nest in my desk, left to exist and expire in peace. What do you do when the thing that keeps you alive was the same thing that was destroying you? When it caused your body to wage war on itself. Bruised and splotchy, I examine the latest apple I found at the bottom of my purse, the one I knew was there but tried so hard to forget. Finally, I bite into it, eating around the bruises. Some stretch all the way to the core, creating pathways of pain to the apple’s center. I feel like this in 2016; bruised to the core, waiting to heal from wounds that exist much deeper than the surface reveals. My elbow rests on my hipbone as I drift to sleep; sometimes it fits there a little too well, chronic illness and a tired year carving away at my existence. This entry was posted in On Reflection on December 17, 2016 by Taylor Soule. The treadmill cheerfully beeps at me, as if we haven’t been on a year-long break, as if I haven’t been avoiding it for months. I enter my age, now 24. My weight, now 120. At this time last year, I tapped the numbers of 23 and 105. I remember my pale reflection in the TV as I watched “Boy Meets World,” subtitles and sounds swirling into a dizzy cacophony, one I couldn’t keep up with. This entry was posted in On Reflection and tagged LSAT, running on December 4, 2016 by Taylor Soule.